Product Detail: Serenity Series Espresso Oak Canopy 48"x18"15"
Standard Series Espresso Oak Cabinet 48"x18"32"
Product Name: Serenity Series Espresso Oak Canopy 48"x18"15"
The Serenity Series cabinets and matching canopies offer hand-crafted style for your aquarium furniture needs. Constructed of oak wood, these well-designed items add sleek appeal to your aquarium while providing sturdy support for the weight and structure of your tank. 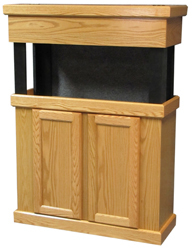 The tank sits on the stand at 34" high, and the trim adds 2" to the stand height. Trim on the bottom of the cabinet matches that on the top for a finished look. All corners are mitered for added structural integrity and visual appeal. The doors are 5 piece flat panel style and they simply add to the elegance and functionality of the stand. All double doors have an EXTRA wide opening for access inside cabinet. This by far is the best feature for aquariums with ANY kind of filter in the stand: the extra room is a must for maintenance. Available in a variety of stains, these furniture pieces will blend in with your decor, making your aquatic display the center of attention. Add a matching canopy with your purchase! The canopies for the serenity series stands are 15" tall. They elegantly hide the top rim of your aquarium while matching the stand perfectly. 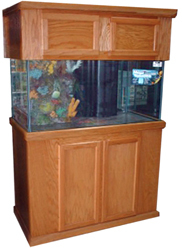 Double doors on the top open for easy feeding, and the top rim is actually a hinged panel for easy access to the entire top of the aquarium. The sturdy oak construct allows you to mount your light fixture directly to the canopy!